Hello and welcome back, happy June! I'm behind and honestly June really snuck up too so I don't have my favorites to share today but I will soon! Today I do have some fun summery nail art to share with you though. 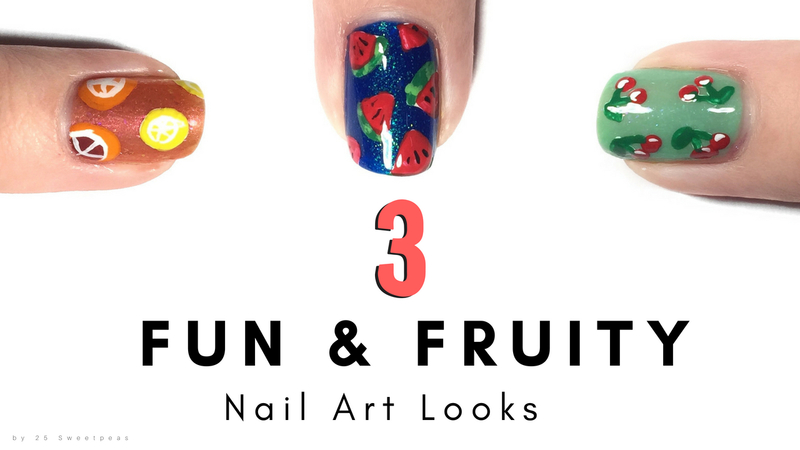 I have created 3 different fruit nail art looks so show you, so lets get right to it! I always see cherry art and always think, oh thats cute but I never actually do them, and fun fact I used to love cherry things. 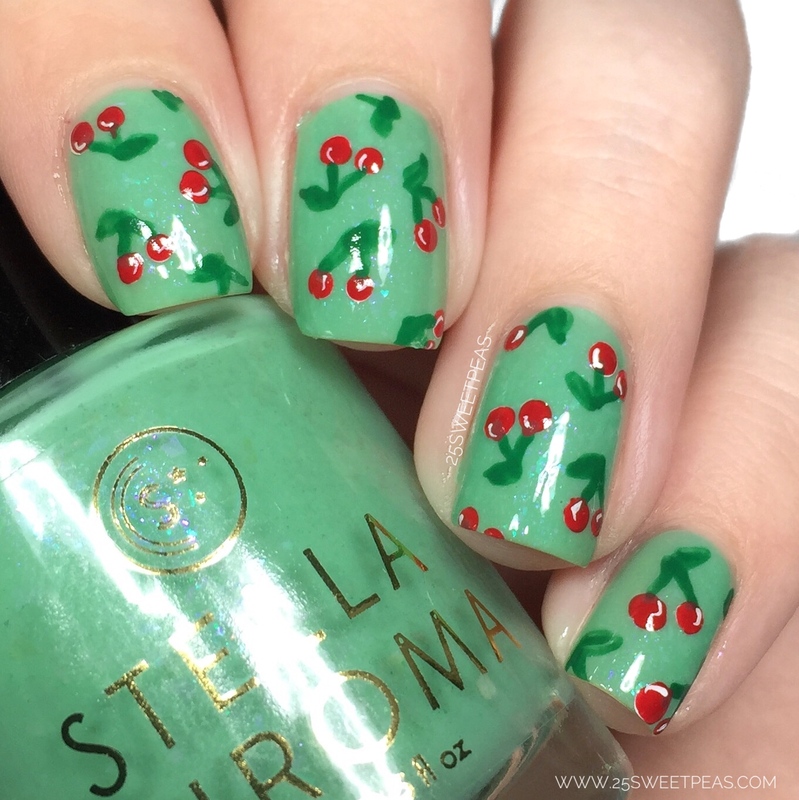 So I thought it was about time to do a cherry manicure! 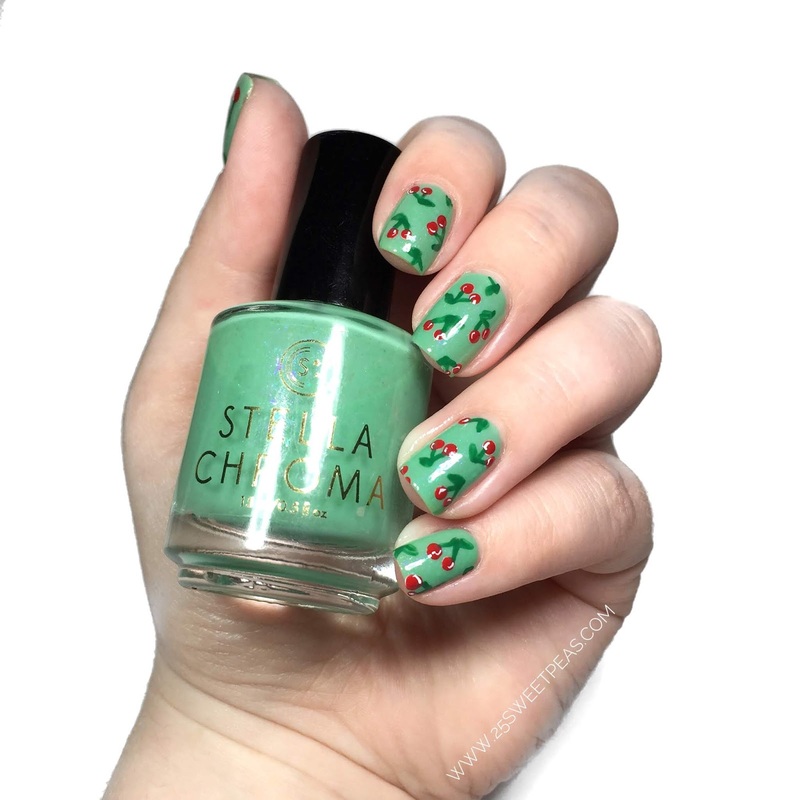 :) Plus when I put on Stella Chroma Garden Treasures for some reason it made me think, cherries! Its a super easy look to create as you can see in todays video! I used all acrylic paint for the art which means you just need to pick a polish base. :) I used a medium sized dotting too and a fine art brush. Next up I kinds stretched the "fruity" theme and went citrusy. 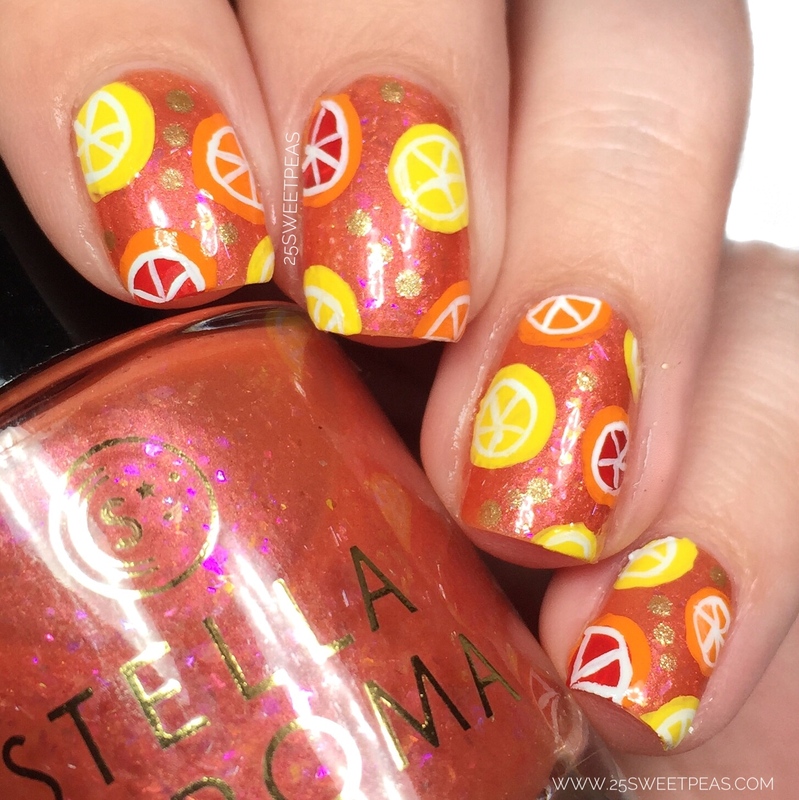 Now in the video I only have the citrus on my nails but here I did add some golden dots to bring it all together. I started with 2 coats of Stella Chroma Coral Couture. 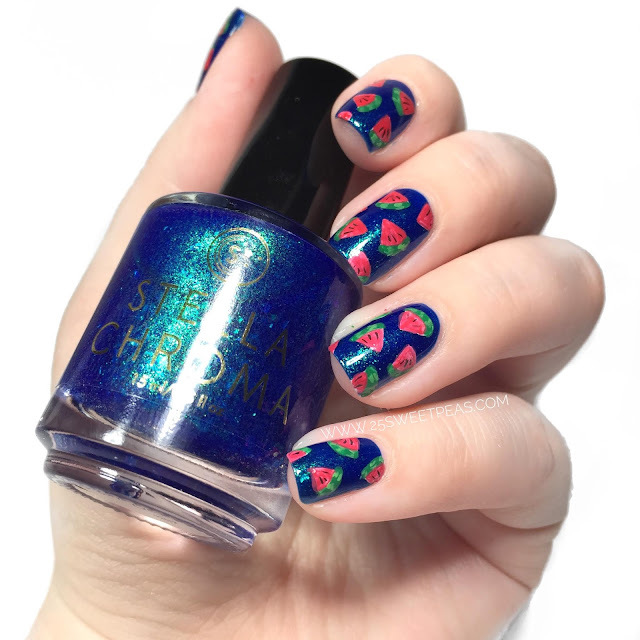 Lastly we have my fave of the post which is this juicy watermelon look on this gorgeous blue polish called Where the Sky Meets the Ocean from Stella Chroma. (I just LOVE this polish!) 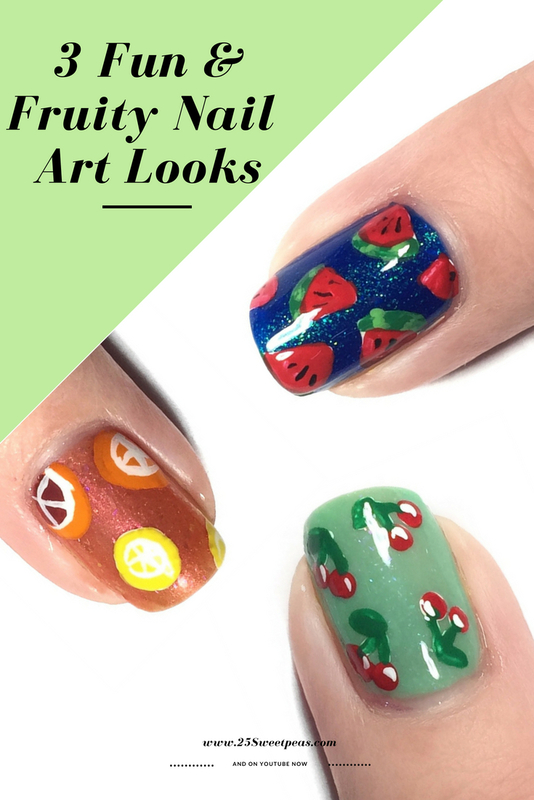 I once again started the fruits with white acrylic paint based so the colors would really pop on top of the polish! :) I did use two green fro the rind, and I did use a mixture of pink/red for the watermelon juicy part! I just love this color combo, and all of these designs were super fun, and summery I could say. I'm all about everything summer too which y'all know so no surprise that I really enjoyed this huh?! Again you can see all of these done in today video. As for polish wise you can check out THIS post for all of the details on it because it is coming out soon. Hope you enjoyed this and hope you are having a great day! Super cute! Love the cherries especially. Love these summer nails! The watermelon are my favorite because I LOVE the fruit! Me too, the watermelon mani I think I ended up wearing for 2 days which does happen often! I just couldn't part with it yet! Watermelon is soooo refreshing! totally wish the one downstairs was already cut! LOL! I love that the SCs work with the art! 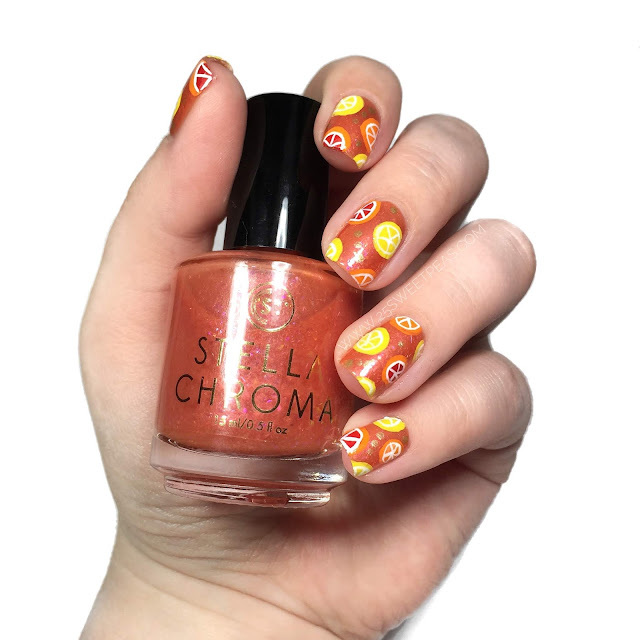 They make a fun base, and I usually feel weird doing art on top of polishes like these but it worked! 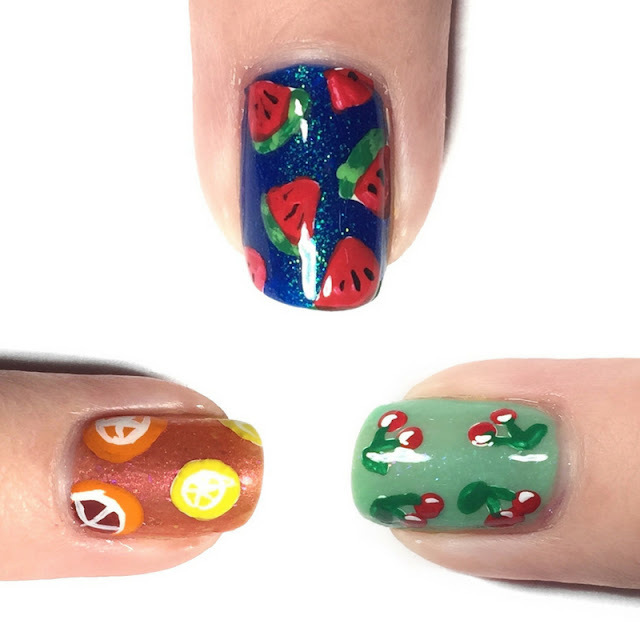 I am so in love with the cherries and the watermelons! I am going to try recreating something similar thanks to your great tutorial on YouTube! Hope you do, can't wait to see if so! I love those too, fun to do! All three designs are really cute, but as a watermelon fan, that one in particular is my favorite! These are all so pretty! 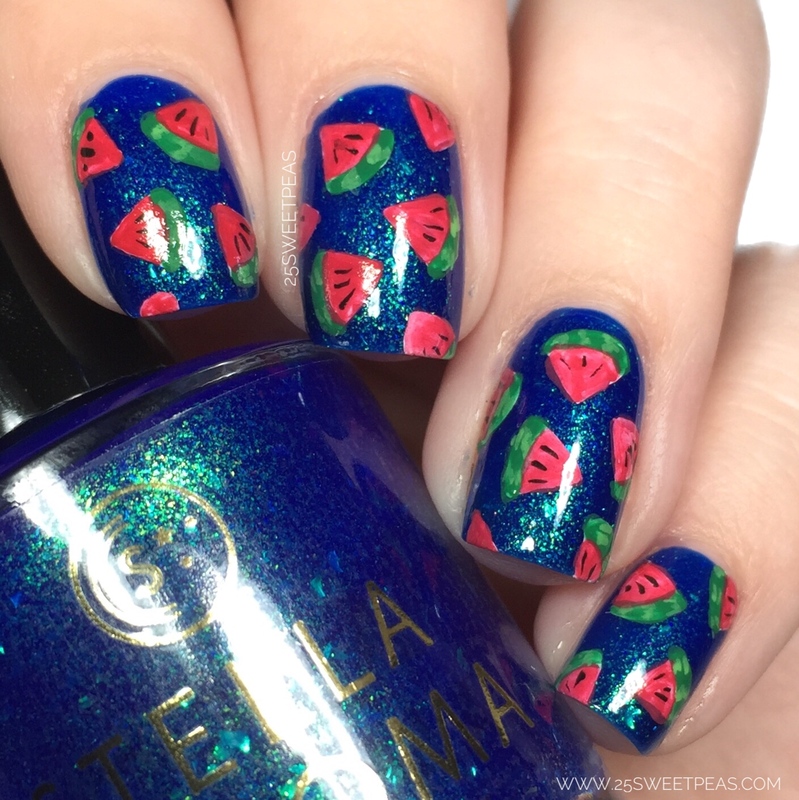 The color palette on the watermelon mani really pops! Those are all fantastic! I really love the watermelons!